In case you don’t already know, I’m a big fan of staying in condos on my vacations to Hawaii. Sure, staying at a four or five-star hotel is a treat, but you really can’t beat the conveniences and price of staying in a condo anywhere in Hawaii. 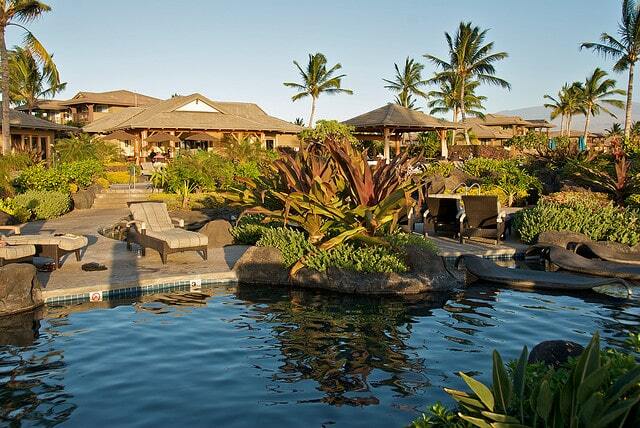 In fact, I’m going to the Kohala Coast of the Big Island in March and I’ll be staying in a condo. 1. You’ll save money on accommodation cost. From my experience, I’d estimate that the average cost for a condo in Hawaii is somewhere around $200 to 250 per night, but you can find many for much less than that. In fact in March, I’ll be staying in a brand new condo with a beautiful golf course and sunset view for $150 per night. On average, most Hawaii vacation condos sleep 4 to 6 people, making it a great choice for families who need the extra room. The kids can have their own room, while mom and dad get some privacy in their own bedroom. I just visited Oahu in May and rented a house with a bunch of fellow photographers. We stayed at a house we found on www.vrbo.com and it was great! Splitting the cost of the rental between us worked out to be about $550 each for a week. Beat that for Hawaii vacation budget-friendliness! Word of advice though, you may want to take care of the money arrangements ahead of time just to be safe (or in case you don’t completely trust the $pending habits of your rental buddies). 2. You can cook some meals. Every condo I’ve stayed in has well equipped kitchens. Many of them are quite nice with granite counter tops and stainless steel appliances. They usually have lots of extra stuff like toasters, blenders, and full-sized coffee makers (not those microscopic, 2 cuppers that you find in a hotel room.) Most condos have grills, too. So if you get to go fishing in Hawaii and catch a nice fish, you can grill it for dinner. So, stop off at the Safeway or Foodland in Hawaii, pick up some milk, cereal, fruit, bread and sandwich stuff for lunch and you’ve saved bunches and bunches of money – I’d estimate at least $20 per person per day. The photo on the right shows one of my favorite breakfasts in Hawaii. Kona coffee and a Safeway cinnamon roll with cream cheese icing. (Trust me, they were delicious, though a bit decadent.) We took that photo while staying at a beautiful ocean front penthouse condo on the North Shore of Kauai. 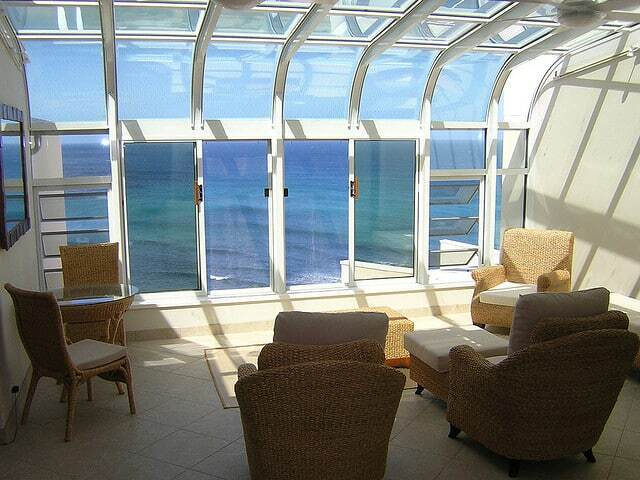 Who can beat that ocean front view from the lanai? 3. Most condos have a washer and dryer. So, you can pack light and you know I’m a big fan of that! 4. Many condos are equipped with coolers, beach towels and beach chairs. Hawaii has so many gorgeous beaches and it’s so nice to be able visit different beaches with your own beach chairs. It’s also handy to have a cooler of cold drinks in the trunk of your rental car when you’re out sight-seeing. Sometimes, you can get lucky with other amenities that you’d never find in a hotel. In the condo we stayed at in Kauai, we had a telescope for star gazing, a sunroom (shown in the top left photo), a Japanese soaking tub, and remote controlled, surround sound stereo system. 5. You’ll have a bit more privacy and a lot more space. I think this one is pretty self explanatory. Some vacation rental amenities are almost comparable to high end hotel resorts. For example, we really loved the beautifully landscaped lagoon-style pool at Hali’i Kai vacation resort on Hawaii, the Big Island. So how do I find the condos I rent? I usually find them on www.VRBO.com (Vacation Rental By Owner). It’s a bit of a clunky website to use, but if you can set aside the time to sift through it, you can find some real gems. They also have the biggest inventory of vacation rentals in Hawaii. Another site that’s emerged in recent years is AirBnB.com, which tends to offer one-room accommodations, but you can find a few apartments and villas. Before you rent, make sure you’ve used my tips for selecting a Hawaii vacation rental. Alternatively, if you’re a bit worried about working directly with the owner rather than a full management company, then Castle Resorts, Aston and Outrigger are Hawaii’s largest companies who manage condo vacations. My only hesitation of renting through those companies is that they rarely let you choose the exact unit. Personally, I like to know exactly what I’m getting. You can find some high-end vacation rentals that offer most of the conveniences and amenities of hotels — such as onsite restaurants, fitness centers, etc. On Maui, Westin, Houna Kai and Marriott – all located in Kaanapali — offer luxury vacation condos/villas resorts. On Oahu, Marriott and Disney’s Aulani both offer vacation club condos in Ko Olina. On Kauai, check out Westin in Princeville. There are some “downsides” to renting a condo, though they’re really not so bad. Unless you stay through a hotel managed property — like Aston, Outrigger, Westin, etc — you won’t have daily maid service to make your bed or give you fresh towels. Some owners may offer the option to add daily or semi-weekly housekeeping services for an additional fee. Each condo is individually owned and decorated. Some are beautifully decorated and others make you wonder what were they thinking. With the exception of the hotel managed condo resorts, most condos are individually owned, They are not all kept up to the same standards. Check out websites like TripAdvisor.com for reviews. Also, don’t be afraid to ask the owner for references, if you have concerns. Bear in mind that you’ll still have to pay Hawaii hotel tax at a rate of over 11%. You may have to pay a cleaning fee, that’s usually around $150 for your entire stay. You may have to pay a security deposit up front to protect the owner from any damage that you may inadvertently cause. The deposit will be refunded if you don’t damage anything. What are your thoughts? Do you prefer a hotel or condo? Condos all the way! Especially for stays of 5 or more days. I need to know where that 1st picture is from! Amazing! Hi Lissete — Good point about condos making more sense on stays of 5 or more nights. Generally the longer you stay the better deal you can get. The first photo was of the sunroom in Pu’u Po’a Condos (unit 409) in Princeville, Kauai. Its was a really, really nice condo with a million dollar view. I think I still have the owner’s e-mail address, in case you’d like to contact him. “Some are beautifully decorated and others make you wonder what were they thinking. ” I had to laugh b/c we stay at condos and boy we’ve stayed at some that are stuck in a time warp! From metallic wallpaper to silk flowers that haven’t been changed out in a minimum of 20 years to some of the most antique looking appliances but we’ve never regretted staying at a condo regardless of the decor. The past few years we’ve taken to staying at vacation homes so we have a pool all to ourselves too which is nice and I’ve found some surprising deals from $250+ for places with a private pool and great decor. Hi Angie -Thanks for your comment. Oh my goodness, “metallic wallpaper” and 20 year old silk flowers. How funny! When I’m condo hunting online (usually on VRBO), I only consider the ones with enough photos that you can tell if it’s decent or not. Do you have any favorite rental companies that you use? Hi Christian – Turtle Bay is a really nice area. I just wrote about Kihei being Maui’s best kept secret and I’d say that Turtle Bay might be Oahu’s equivalent. I think it’s just gorgeous there. What’s the latest on Turtle Bay Hotel? I read that the state government is considering buying it. I’d really hate to see it go away from being a hotel. the toilet paper should be limited but the rest was complimentary when there were other issues. The owner refused to publish it and I didn’t think that was right for future renters so I did an objective review on my blog. Oh my goodness, Angie. I read your balanced review of that house. The infestation in the dishwasher would have been enough to drive me crazy. I’ve been to Hawaii enough to know that it’s not unusual to see those kind of “friends” even in 5 star hotels, but that dishwasher sounded like a nightmare! You might want to consider writing a review on TripAdviosor as well. Thanks again for sharing your experiences. Hi David – $105 per night with a nice view and location in Maui is an awesome find. Especially considering that the last hotel room stats indicated that the average room rate in Maui was $269 per night!! ResortQuest Hawaii provides this service. It’s the same type of service you would expect at a hotel. Great ideas, just cooking at home will save lots. I completely agree, condos are the way we prefer to travel. With two small kids, the extra space and the ability to cook our own meals is a fantastic benefit. Last time in Maui, since we were staying in a condo we could go to the best seafood store nearby and buy our own fish to cook dinner. It was wonderful and much less expensive than eating out! And, the washer/dryer combo with two kids is a necessity too – great post! @ Dave – thanks for clarifying that point about housekeeping service at ResortQuest. @foxnomad – oh yes, just cooking your own breakfast can save a bundle, especially when most hotels have breakfast buffets that cost $20 to $35 per person! @ Gudrun – thanks for sharing your experience. I can certainly see how staying in a condo would suit a family with children more so than staying in a hotel room. Great article! Always check to see if the vacation rental has an accommodation license. Many of the condo and apartment rentals that are listed on the web do not, and they offer various deals to “get around” Hawaii’s laws, including 30 day leases. No accommodation license means no recourse for you, the renter, when something goes wrong. Hi billso – thanks for your comment and insight! I have to say the licensing thing is confusing for us visitors. I’ve contacted the various counties and organizations and very few people want to give a clear answer. – Condo’s located in large vacation type condo communities are usually not required to get licenses. – The Big Island is basically unregulated at the moment. Any additional authoritative source you could point us to would be much appreciated. I know this post is from 2008, but now taxes are 12.42%! In September my family ( 4 adults and 2 children) will be travelling to Honolulu from Australia. We are looking for some must do’s and some recommendations re accommodation. Thinking of a condo in a convenient location.